Jake Bronstein has been placing the vending machine shown above all over Manhattan. 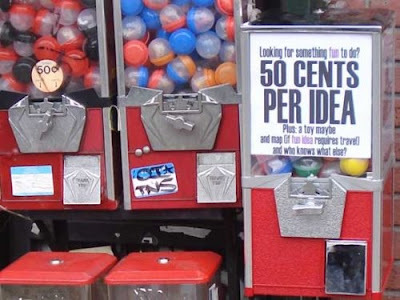 50 cents buys you a tiny plastic capsule that contains a toy, a quarter refund (he couldn't make the machine take less than 50 cents), and an IDEA. What kind of ideas do you suppose the machine dispenses? Another reason to move to New York. *sigh* New York is soo cool! Get one! get one! And tell us what the idea is! I wonder how he thinks of that many ideas, I mean I only have a few every day and most of them are related to writing or craft projects and what would a passerby need with an idea like, "add a combat android" or "try making pony horns out of beaded wire"? I knew I should have made dad keep the candy dispensors. And that is way beyond awesome. IDEA#4556798: Read Kiki Strike by Kirsten Miller and then go to Ananka's Diary. Take me to NYC people, NOW! I agree with cupcake doll! that...is...amazing! because that's exactly what you need, more insane ideas! you should buy some and post them! That makes me want to go all the way to New York and get one! How to make your own giant, neon-gren hot dog? !!! Why don't we have these in Chicago? dido, yeah Ananka you should go get one and tell us what it said! That is beyond cool! I want one! Oh my god, I have to find one. Just got back from camp...ahh so much catching up to do!